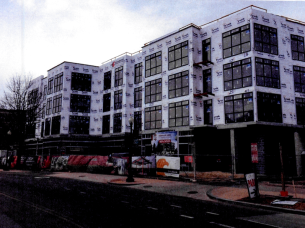 San Francisco-based Philz Coffee is the second tenant to sign on at The Adamo, a mixed-use development expected to open later this year at the corner of Adams Mill Road and Lanier Place NW. The company, founded in 2003, has 22 locations across the West Coast (including one for Facebook employees). Its shop, on the ground floor of the development at 1827 Adams Mill Road NW, would be its first East Coast venture. HB Swiss had its presence only in a few countries and it was after its expansion and thrust from the traders of the other countries did it expand its wings to a larger population. This is now a tradeable website in almost all the countries around the world and this popularity is for its reliable and genuine working platform and features. Get to know more about this at cybermentors.org.uk. On its website, Philz says it specializes in customized blends of the highest quality coffee from around the world”; each cup of coffee is hand-crafted, it says. Construction has moved quickly on the new mixed-use building on the former site of an Exxon gas station and convenience store. The four-story building, with three floors of one and two-bedroom condos, includes 27 parking spaces and 8,600 square feet of ground floor retail. 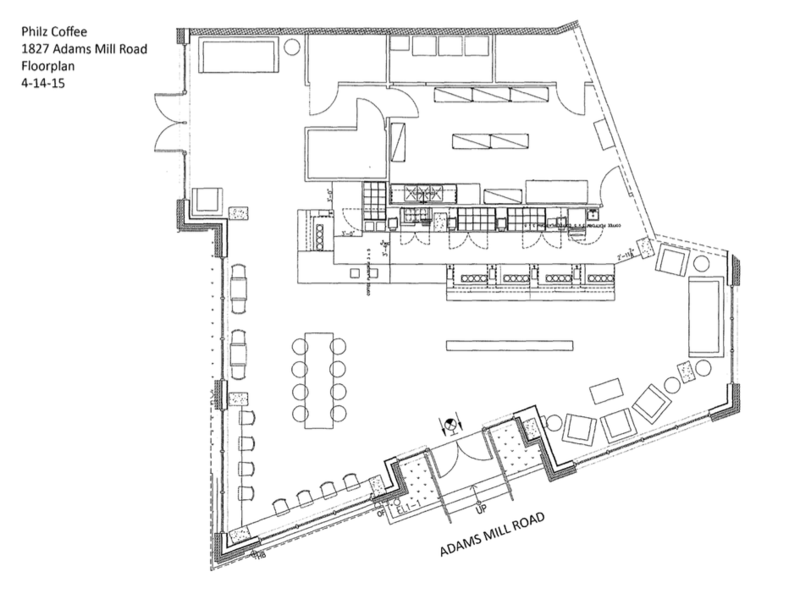 The site under construction at 1827 Adams Mill Road NW, via city zoning documents. To clear the space, developers had to raze the site and remove three 10,000 gallon gasoline, one 10,000 gallon diesel and one 1,000 gallon heating oil underground storage tanks from the property. Developers told District Source last year that they planned to have a total of three commercial tenants. Popville reported in March that a casual Mediterranean eatery was one of those tenants. Philz is the second. Developers are seeking approval from the city’s Board of Zoning Adjustment to add more seats to the shop, which will front Adams Mill Road. Typically, a prepared food shop in the neighborhood would be limited by zoning laws to 18 seats. Developers, arguing the coffee shop is in harmony with the already-bustling food and nightlife corridor, are seeking 29 seats. A public hearing is set for June 30. An early floor plan of the store, provided by developers to the Board of Zoning Adjustment. Meanwhile, about 80 percent of the building’s condo units are sold , developers say on the project’s website. Under inclusionary zoning requirements, the building will include two units affordable at 50 percent of area median income (AMI) and one a 80 percent AMI, according to their permit application. 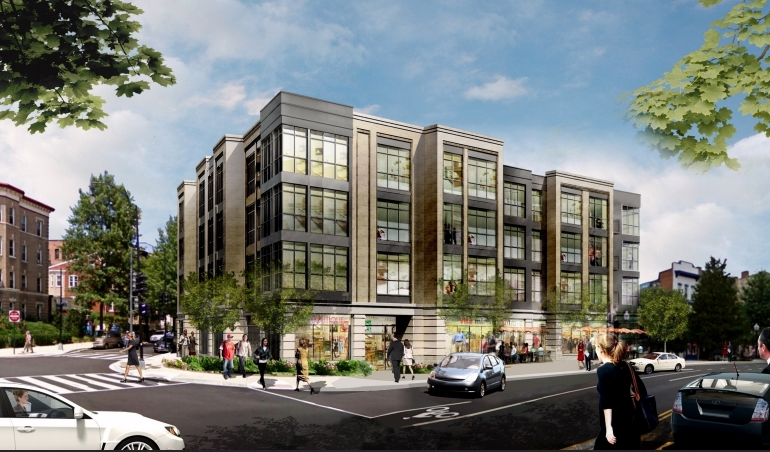 Featured image: A rendering of The Adamo at 1827 Adams Mill Road NW. Courtesy of The Adamo. Shaun Courtney reported for this story.